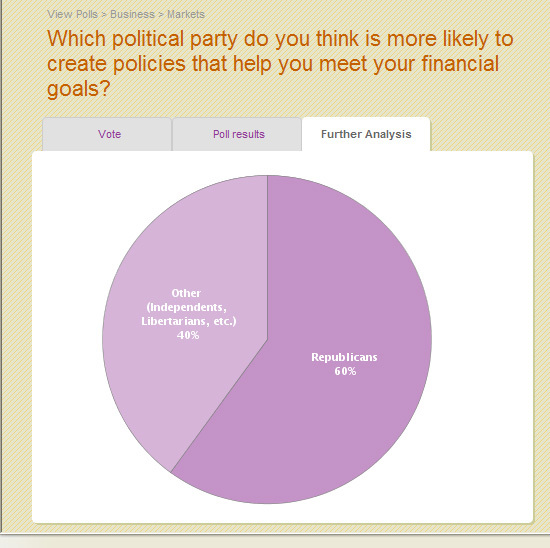 Below are the results from day 1 from my original post Politics and Personal Finance. Interestingly, not a single person listed the Democratic Party as being the best political party for your personal finances. I don’t want to get ahead of myself, but already I’m a bit curious whether or not the party that is best for your finances is also the party people would actually vote for (or do other considerations such as social policies, etc. weigh more heavily). I look forward to seeing more results – please vote and also feel free to provide comments on why you voted! here’s another idea of how the government can spend our money.